Every day, contractors and trade professionals face dozens of unique situations that require different types and sizes of ladders. In many cases, operators are forced to overreach or use the wrong kind of ladder to get the job done. Little Giant engineered the ComboSXE™ lightweight telescoping ladder to prevent injuries by giving pros a versatile, strong, yet lightweight climbing solution for dozens of applications. The ComboSXE is constructed of nonconductive, high-strength, lightweight resin fiberglass. 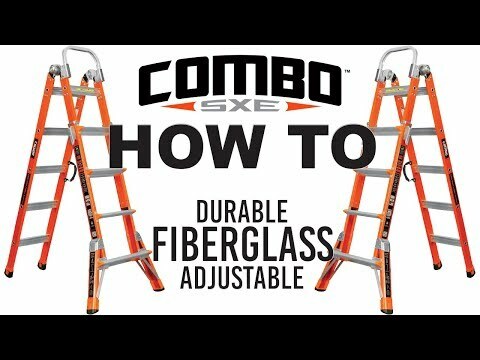 The ComboSXE is a fully articulating and telescoping combination ladder—the only one of its kind. It works as both a two-sided, two-person stepladder and as a multiple-height wide-base extension ladder. The ComboSXE’s wide-flared side offers superior side-tip stability while its straight side allows operators to access tight work spaces between wall or ceiling trusses and roof or attic access ports. The ComboSXE meets or exceeds all OSHA, ANSI and CSA standards for combination, extension, and A-frame stepladders. 13-foot model comes with V-Rung. The Combo SXE Ladder is available in 12 and 13-foot sizes. The ComboSXE’s wide-flared side provides side-tip stability. The straight side allows operators access to tight work spaces. It is both a stepladder and a multiple-height extension ladder. A-Frame Min. Height 5 ft. 6 ft.
A-Frame Max. Height 5 ft. 6 ft.
A-Frame Max. Highest Standing Level 2 ft. 11 in. 3 ft. 10 in. Extension Min. Height 9 ft. 10 ft.
Extension Max. Height 11 ft. 12 ft.
Extension Max. Highest Standing Level 7 ft. 10 in. 8 ft. 9 in. Storage Height 5 ft. 6 ft. Storage Width at Base 2 ft. 5 in. 2 ft. 5 in. Storage Depth 8 in. 8 in. Max. Footprint 3 ft. 4 in. 4 ft. Ladder Weight 30 lbs. 33 lbs. Shipping Weight 36 lbs. 40 lbs.